In 2009, CEDAW was the first UN treaty body to include intersex in their Concluding Observations for Gemany (though not IGM). 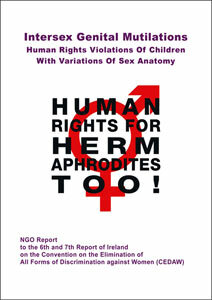 This Thematic CEDAW NGO Report for Ireland builds on the previous 2015 Report to CRC who already reprimanded Ireland for IGM practices. • The Committe issued >>> Concluding Observations on IGM as a “harmful practice”.